Wall mounted racks can be fixed to the wall and are supplied with the mounting holes already drilled, simply use standard screws and wall plugs. Gardenista’s range of wall mounted and free standing wellington/boot racks are manufactured in the UK with quality pine redwood, available in 3 sizes. All racks come ready assembled and ready to use with no assembly required, a great piece of furniture for use everyday. Please see our Amazon shop for a large range of products for your home and garden. 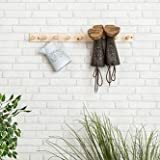 This entry was posted in Home Decor Supplies and tagged Boot, Mounted, Pair, Rack, Riding, Storage, Walking, Wall, Wellington, Wooden by 4logis. Bookmark the permalink.